Jon Bernstein listens to a story pitch at the 2018 Writers Studio. Enroll soon for the 2019 Writers Studio, held February 7-10, 2019. Here’s what some former Writers Studio participants have to say about their experience. 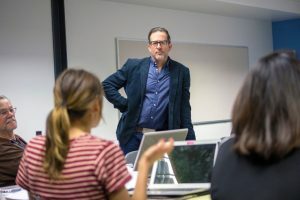 Offered by the UCLA Extension Writers’ Program, the Writers Studio brings together a community of writing students to workshop with some of Southern California’s most accomplished writers and teachers. From among the 11 offered, participants choose one workshop in which they work closely with a professional writer in classes limited to no more than 15 people. For more information: writers@uclaextension.edu or (310) 825-9415.